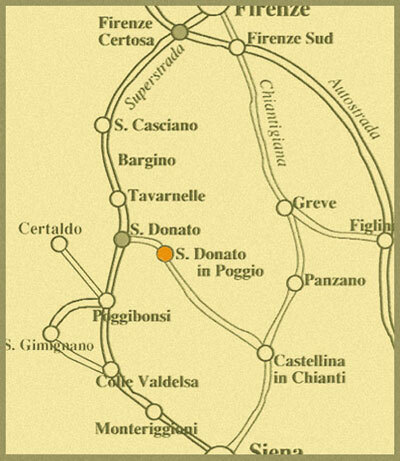 AT Firenze Certosa, get on the Firenze Siena superstrada (4 lanes) towards Siena, take the exit marked S. Donato. Now Follow the indications for S. Donato. Yuo'll reach it after 2 km. Leaving the airport take the road on the right that will lead into the A11 (autostrada/motorway 11) Firenze - Viareggio, immediatly exit at the first exit Firenze Nord, and take autostrada A1 towards Rome and exit at Firenze Certosa. At Firenze certosa get on the superstrada (4 lanes, it is immediatly on the right) Firenze-Siena, towards Siena. Exit at S. Donato, follow the indication for S. Donato. You'll reach it after 2 km. Take A11 autostrada towards Firenze, exit at Firenze Nord, take autostrada (motorway) A1 towards Rome. Exit at Firenze Certosa and get on (immediatly on the right) the superstrada (4 lanes) Firenze. Siena, towards Siena. Exit at S.Donato, follow the indication, after 2km you'll reach S. Donato. Take A1 autostrada (motorway) towards Rome. Exit at Firenze Certosa and enter in the superstrada Firenze-Siena towards Siena. Exit at S. Donato, follow the indication, after 2 km you'll reach S. Donato.